Here in Southern California we've felt the heat these past few weeks with temperatures reaching well over 100 degrees in some areas! While we humans try and beat the heat by going to the movies or the beach, remember our furry friends don't have it easy. Overheating is the primary concern for dogs and cats during the summer. Heatstroke can be fatal once a Pet's temperature reaches 104 degrees or more. ▪ To all of our flat-faced Pets: Pugs, Bullys, Pekingese and Persian cats... These breeds are prone to heatstroke since they cannot pant as effectively. ▪ To all of our elderly or overweight Pets: Pets with heart, lung or other medical problems face a higher risk of overexertion and overheating. It's up to us as Pet Owners to watch after our little Animals during these hot Summer days and try to keep them cool as possible. Here are some fun tips! ▪ Ice cubes in the water bowl and always remember to keep your Pets water dish full to the brim so that they keep hydrated at all times. ▪ Try and go on walks in the early morning or toward the end of the day to insure a nice cool pace while the sun is almost up or down. ▪ Give your Pet the Summer haircut they've been asking about. Trimming long hair can help keep your Pet staying cooler. ▪ Hose'm down! Spraying your Pet down with the garden hose is a quick way to lower their body temperature and can be a lot of fun if your Pet is into that sort of thing. Summertime is the PEST time and ALLERGIES seem to have it their way. ▪ Fleas, ticks and tapeworms are more problematic during the summertime than ever. Keep your pets up-to-date on preventatives and make sure to inspect their coats for any pests after outdoor activities. ▪ Summer is prime time for allergic reactions that can cause itchiness and hot spots. Some Pets are even allergic to flea bites and can cause them to scratch excessively. Book your appointment online or call us now at 1-800-FOR-A-VET. 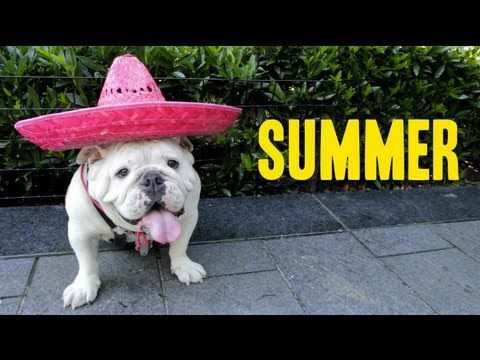 From all of us at Grand Pet Care Center, we wish you and your Pets a happy and safe Summer.